Photo: HEIDI WALTERS. – The catch that may not come. “This was a weird year for the ocean,” says Dave Bitts. The 40-year veteran of the local fishing industry and president of the Pacific Coast Federation of Fishermen’s Associations is docked at Woodley Island. He sits at the Marina Café nursing a cup of coffee and talking with some other fish folk about the weather. Normally, the captains wouldn’t be found on dry land any morning past the first of December, the traditional opening date for crab season on the North Coast, but a public health threat has grounded the fleet, spelling possible disaster for thousands of small businesses and families. As Bitts said, it’s no ordinary year. First, it was the salmon, or the lack thereof. Many small operators fish for salmon in the summer and crab in the winter to make ends meet. This year, however, the runs were thin. Bitts says he grossed about half of his usual haul. He caught a total of six fish after July 8. “We had that warm water sitting off the coast, it definitely affected the distribution, if not the numbers,” he says, adding that scientists have also noticed the salmon eating strange things, indicating that their normal diet may have been disrupted. Biologists also blame warmer ocean water for a large algal bloom stretching from the central California Coast up to Washington. The biggest bloom in over a decade, it’s producing unprecedented levels of domoic acid, a powerful neurotoxin that has rendered large quantities of shellfish harmful to human health and forced public officials to stall the opening of the crab fishing season. At the hearing, which was hosted by State Sen. Mike McGuire and Assemblyman Jim Wood on Dec. 3, Bonham reviewed the options in front of officials. The CDFW has set up a hotline and a webpage for crabbers to call for updates. It will take two consecutive weeks of clean tests before the agency considers opening the season. The worst, many agree, would be no crab at all. It already seems likely that the season may open after Christmas, traditionally the height of consumer demand for the Dungeness. McGuire refers to the publicly stated desire of many crabbers to ensure safe conditions before hoisting anchor. McGuire, too, praises the high standards of Bitts and his ilk. At the Dec. 3 hearing, which brought together scientists, politicians and state officials, there was near-unanimous agreement that climate change is responsible for the changing ocean. Cat Kuhlman, deputy secretary for Oceans and Coastal Policy at the California Natural Resources Agency, warned that these conditions “are the new normal.” Many who work the seas agree. McGuire has put out the call to those in the industry to begin tallying this season’s costs so far for possible reimbursement, should a state of emergency be declared. On Nov. 24, congressional representatives sent a letter to Gov. Jerry Brown requesting the state consider compensation if the season is canceled. Bitts says some relief money would be welcome, especially to pay seasonal workers who have been standing by, waiting for their chance to pull out of port. Many captains have lost their crews already. Still others have sunk their savings into gear and getting their crafts ship-shape, leaving little left over for buying Christmas presents. But Bitts says he would rather have the season open late than not at all, adding that the most profitable season he ever had began in January. A start as late as March or April, though? That would be hard, he says. Businesses and industries tangential to crabbing are also feeling the squeeze. Processing plants, which normally run all hours at full tilt during the season, have stopped hiring. On the other side of the bay, Seth Griggs, third generation owner of Custom Crab Pots, says that a busy November has tapered off into silence. It was a similar bump that knocked Tim Harkins, formerly a Trinidad crab fisherman, out of the industry in 1992. The season was delayed by many rounds of price negotiation and the subsequent strike of crabbers up and down the coast as they waited for buyers to set a better price per pound. 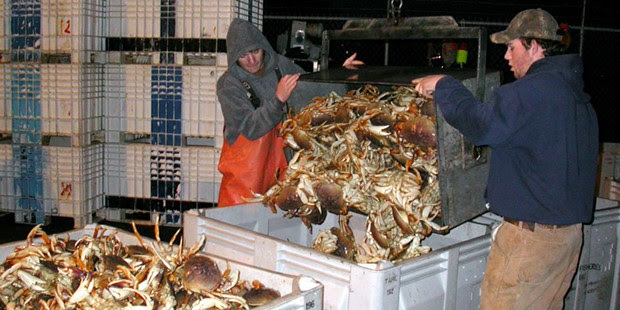 Strikes, delays due to underweight crabs, and the vagaries of the weather are common in the industry. “I would never have much of a margin,” he says. It was, and is, a gamble. Bigger operations might make a year’s salary in two months. Harkins fished year round. With two kids at home, he was barely making it. The strike broke when some boats in Newport decided to leave harbor. Everyone else followed suit, “stumbling out of the gate.” Then, a few weeks into the season, the news came down. Domoic acid had been found in shellfish off the Washington Coast, the first such discovery. Fishing stopped for the season, and Harkins decided to get out for good. He went on to become a school bus driver, a job with its own set of challenges but a great deal more stability. “When you fish, there are so many things you have no control over, and one or two more make it the tipping point,” he says. all the fisherman sat at the conference call. in hopes that tomorrow would be opening day. were just sitting down, they had done it again. “Well you know guys we’ve got way too much inventory. people jumped out of bed to see what was the matter. and we all settled down for a long winter’s wait. but we just didn’t count on that bad Newport crew. then came unfamiliar words, DOMOIC ACID. and over both shoulders some crabs we did throw. For a lot of us Christmas really wasn’t that nice. Well you knew things got screwed up, now you know the reason. Happy New Year to all, and, well, maybe next season.